Najafizadeh, A., Jonas, J. (2006). The Strain Dependence of Post-Deformation Softening during the Hot Deformation of 304H Stainless Steel. International Journal of Iron & Steel Society of Iran, 3(1), 1-7. A. Najafizadeh; J. J. Jonas. "The Strain Dependence of Post-Deformation Softening during the Hot Deformation of 304H Stainless Steel". 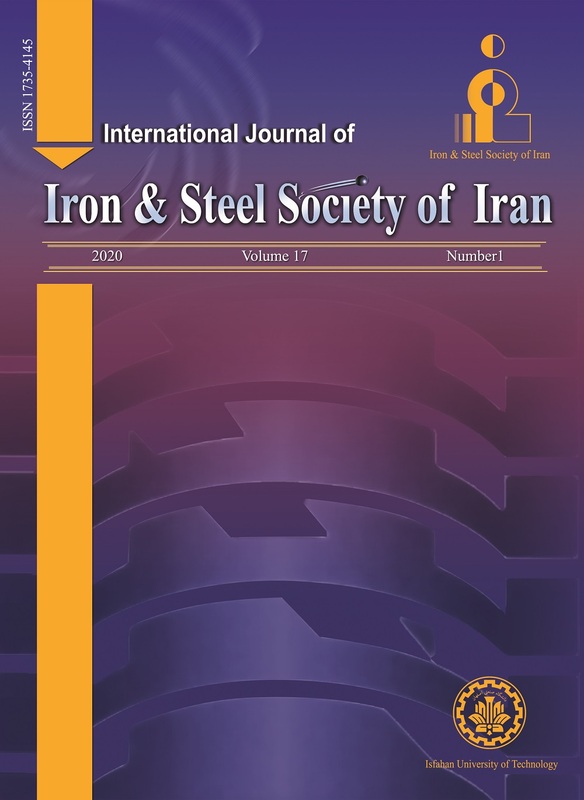 International Journal of Iron & Steel Society of Iran, 3, 1, 2006, 1-7. Najafizadeh, A., Jonas, J. (2006). 'The Strain Dependence of Post-Deformation Softening during the Hot Deformation of 304H Stainless Steel', International Journal of Iron & Steel Society of Iran, 3(1), pp. 1-7. Najafizadeh, A., Jonas, J. The Strain Dependence of Post-Deformation Softening during the Hot Deformation of 304H Stainless Steel. International Journal of Iron & Steel Society of Iran, 2006; 3(1): 1-7. Experiments were carried out in which the dependence of the fractional softening on temperature, time and strain rate was determined in a 304H stainless steel. Three prestrain ranges were identified pertaining to three different post-deformation softening behaviors: 1) prestraining to below the DRX critical strain: strongly strain dependent softening by SRX alone with softening kinetics controlled by growth rate of the nuclei; 2) prestraining to above the DRX critical strain: SRX + MDRX softening with weaker strain dependence of the kinetics but still controlled by grain growth; 3) at a prestrain of e* and beyond: nucleation-controlled MDRX softening with the full inhibition of SRX. The transition prestrain e* can exceed the peak strain if the DRX grain refinement ratio g= D0/DDRX > 4. The transition to MDRX-dominated softening can be attributed to a constant value of the normalized strain hardening rate independent of the preloading temperature and strain rate. The softening data from the compression tests show that at e*, the time for half softening t50 exhibits a minimum. These data differ somewhat from observations obtained in the torsion testing of solid bars, in which no strain dependence of t50 was detected at e* and beyond. Whether or not the strain dependence of t50 vanishes in the MDRX range is sensitive to the test method employed to study the post-deformation softening. C. M. Sellars: Mater. Sci. Technol., 6 (1990), 1072. G. Li, T. M. Maccagno, D. Q. Bai, and J. J. Jonas: ISIJ Int., 36 (1996), 1479. H. L. Andrade, M. G. Akben, and J. J. Jonas: Metall. Trans. A, 14A (1983), 1967. S. H. Zahiri and P. D. Hodgson: Mater. Sci. Technol., 20 (2004), 458. J. J. Jonas: Mat. Sci. Eng. A, 184 (1994), 155. C. Roucoules and P. D. Hodgson: Mater. Sci. Technol., 11 (1995), 548. C. Roucoules, P. D. Hodgson, S. Yue, and J. J. Jonas: Metall. Mater. Trans. A, 25A (1994), 389. S. H. Cho, K. B. Kang and J. J. Jonas: ISIJ Int., 41 (2001), 766. S. H. Cho, K. B. Kang and J. J. Jonas: Mater. Sci. Technol., 18 (2002), 389. P. D. Hodgson: Mat. Sci. Technol., 12 (1996), 788. L. P. Karjalainen, T. M. Maccagno, and J. J. Jonas: ISIJ Int., 35 (1995), 1523. E. I.Poliak and J. J. Jonas: ISIJ Int., 44 (2004) 1874. J. J. Jonas and E. I. Poliak: Mater. Sci. Forum, 426-432 (2003), 57. E. I. Poliak and J. J. Jonas: Acta mater., 44 (1996), 127. L. P. Karjalainen and J. Perttula: ISIJ Int., 36 (1996), 729. R. A. P. Djaic and J. J. Jonas: Metall. Trans., 4 (1973), 621. P. Uranga, A. I. Fernandez, B. Lopez, and J. M. Rodriguez-Ibabe: Mater. Sci. Eng.A, A345 (2003), 319. S. H. Zahiri, S. M. Byon, S. -I.Kim, Y. Lee, and P. D. Hodgson: ISIJ Int., 44 (2004), 1918. M. R. Cartmill, M. R. Barnett, S. H. Zahiri, and P. D. Hodgson: ISIJ Int., 45 (2005), 1224. A.I.Fernandez, B. Lopez, and J. M. Rodriguez-Ibabe: Mater. Sci. Forum, 467-470 (2004), 1169. J. M. Rodriguez-Ibabe: Mater. Sci. Forum, 500-501 (2005), 49. P. D. Hodgson, S. H. Zahiri, and J. J. Whale: ISIJ Int., 44 (2004), 1224. I.Weiss, T. Sakai, and J. J. Jonas: Metal Sci., 18 (1984) 77. T. Sakai and J. J. Jonas: Acta Metall., 32 (1984), 189. F.J. Humphreys and M. Hatherly: Recrystallization and Related Annealing Phenomena, (Elsevier Science, Oxford, 1995) 177, 188. Z. Xu and T. Sakai: Mater. Trans. JIM, 32 (1991), 174.